The Ukrainian crisis cannot be resolved through the political manipulation of the region's historical memories. By invoking inflammatory slogans like "Putin is Hitler" and "Ukrainians are fascists", both Russian and western leaders distort the realities of 21st Century Ukraine. 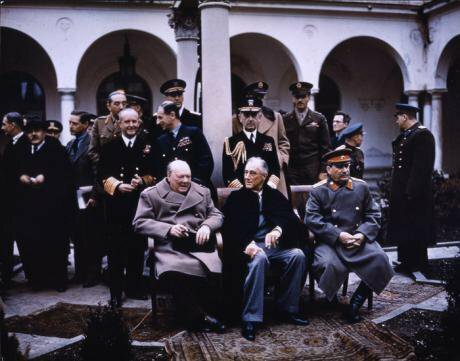 The Big Three at the Yalta Conference, February, 1945: Churchill, Roosevelt, Stalin. Flickr/UK National Archives. Public Domain. It is often claimed that the desire of transcending historical conflicts was one of the main reasons for the establishment of supranational institutions in western Europe after the Second World War. Other factors may have also played a role, notably the urge to accelerate economic recovery and prevent a Soviet military takeover. Nonetheless, it is undeniable that the process of European integration contributed to a long period of peace and stability in western Europe--marginalising conflicts, first and foremost the one between Germany and France--that had ravaged this part of the continent for many decades. Ten years after the accession of east-central European countries to the EU, the stabilising and peaceful effects of integration seem to have reached the new member states too. However, in eastern Europe historical conflicts are proving more difficult to overcome. The crisis in Ukraine provides a good illustration of this situation. In the last two months, many analysts have revisited the history of Ukraine and Crimea in order to explain the broader context and the multiple facets of the current crisis. However, in mainstream Ukrainian, Russian, and western political and media debates, history has been repeatedly distorted and abused for political purposes. The Second World War, by far the bloodiest and most divisive conflict in eastern Europe’s modern history, is the main subject of these distortions. Claims that ‘Ukrainians are fascists’ or that ‘Putin is like Hitler’ were often made in the last months, and not just by extremists supporting either of the conflicting sides in Ukraine. Top European, Russian and US leaders contributed to the development of discourses that systematically manipulate history. An English-language propaganda poster created during the Ukrainian crisisIn his address to the members of the State Duma and the Federation Council on 18 March 2014, Russian president Vladimir Putin called the post-Yanukovych authorities in Ukraine ‘ideological heirs of Bandera, Hitler’s accomplice during World War II’. This and similar statements by other high-ranking Russian politicians were accompanied by a campaign in the major Russian media that portrayed Maidan protesters as ‘fascists’. On the other hand, current German finance minister Wolfgang Schäuble and former US secretary of state Hillary Clinton claimed that Putin’s policies in Crimea were the same as those pursued by Hitler towards ethnic Germans living in Czechoslovakia in the 1930s. Acting president of Ukraine Oleksandr Turchynov publicly stated that Putin ‘copies the fascists of the last century’, while Maidan protesters (and some of their sympathisers) compared the Russian ‘anti-gay propaganda’ law to Nazi policies towards homosexuals. The aim of such comparisons and juxtapositions is that of associating current politics with past events and historical characters that have profoundly negative connotations in public consciousness, particularly in the national arena where leaders are called to justify their policies. In post-Soviet Russian identity, fascism has been constructed as the supreme evil and the ‘Great Patriotic War’--namely the Soviet war against Nazi Germany--is celebrated as a foundational constituent of the current Russian state. However, in Russian political discourse the term ‘fascist’ is increasingly used to denigrate anyone that opposes Russian interests, regardless of political affiliations. Within this established framework, it was all too easy for Russian politicians to portray anti-Yanukovych protesters in Ukraine as ‘fascists’, particularly as some of them publicly displayed their admiration for wartime ultranationalist leaders and toppled monuments commemorating Soviet victory in the Second World War. While criticising Russian leaders’ abuse of the concept of ‘fascism’, many western politicians resorted to very similar discursive techniques. In the United States and the European Union, Nazism and Hitler are widely considered as the worst manifestations of evil. Hence, western leaders sometimes think that they can be persuasive and achieve their political goals by constructing comparisons between their political rivals and Nazis. In the recent past, such analogies were formulated prior to western military intervention against the regimes of Slobodan Milosevic and Saddam Hussein. They may have proven functional to rallying popular support for intervention, but they largely oversimplified and deformed reality. Similarly, comparing Putin or Turchynov with Hitler does not contribute to a better understanding of the Ukrainian crisis. 2014 Ukraine is neither 1938 Czechoslovakia nor 1941 Galicia, and Putin’s Russia is not Hitler’s Germany. 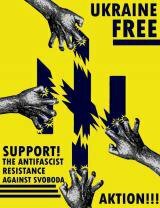 Saying that ‘Ukrainians are fascists’ is false and offends the memory of millions of Ukrainians that fought against fascism and perished under Nazi occupation. Likewise, analogies between Nazi Germany’s and Russia’s foreign policy or anti-gay laws distort historical truth and relativise the Holocaust of homosexuals. Furthermore, such abuses of history reawaken past rivalries and contribute to the discursive escalation of the crisis. Maidan protester in Kyiv, 25 February 2014. Shutterstock / FototarasTranscending conflict requires renouncing the political use of history and of historical memory. Clearly, not many in the Russian and Ukrainian leadership have understood this, and numerous western politicians have joined the cacophony of history manipulators. European leaders may remember their claims that European integration involves leaving behind historical rivalries. If a solution to the Ukrainian crisis is to be found and a truly united Europe is to be built, it is time for all the parties to stop manipulating the past and sit at the negotiating table in order to discuss the present.